- Top notes of citrus, grapefruit and bergamot combined with rose concrete to offer the natural simplicity of an armful of roses from Morocco and Bulgaria. - Discreet heart notes of iris concrete enveloping a breeze of incense. Grisette by Lubin is the very essence of this freedom and desire to live life to the full, encapsulating their natural vitality. 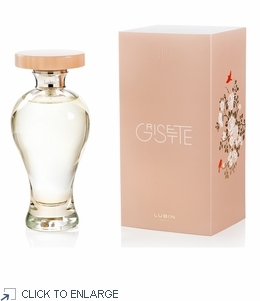 Grisette is a classical composition with top notes of an armful of freshly cut roses. For the first time for decades, we are using an alcolate obtained by macerating rose concrete. This preserves the most volatile notes that mingle with hints of grapefruit to give a green sensation of fresh roses. Grisette then wraps one up in powdery, woody, and spicy notes before leaving a trail of amber and vanilla. - Musk and amber mingle in base notes of woody cedar softening into a haze of Madagascan vanilla absolute. On sunny days, when the workshop bell rang, they would rush off in pursuit of adventure in the bars of Montmartre and the guinguettes on the Marne, where they would dance to the strains of the accordion. These fun-loving creatures paired up with the bohemian students in the Latin Quarter, and provided the inspiration for the artists at Montmartre, becoming the heroines of paintings by Renoir and Manet. Familiar figures in the streets of 19th century Paris, grisettes were the youthful, fresh-faced girls who worked in the capital’s sewing workshops. They were full of joie de vivre and wore grey calico frocks that gave them their nickname. Made in France. Beautifully boxed. Grisette: She slips through the crowded streets on nimble feet with her head held high, a slim, fleeting figure that is the very image of Bohemian Paris. With her rosy cheeks and innocent gaze, she is hurrying to meet her lover, but Grisette is already thinking of another, dreaming wistfully of a new romance. Their first kiss beneath that awning sealed a promise truer than any other vow.